Last seen in 2007, the Air Jordan 1 Retro High OG XQ is set to return as part of the “Ignite Shanghai” collection. This latest release differs slightly from the last as the shoe now comes in a high cut instead of the mid cut from 2007. Height aside, the shoe features the same eye-catching looks as the first release including black leather around the toe box and heel, patterned white leather on the toe box and midfoot panels and red leather on the eyestay, tongue and around the ankle. 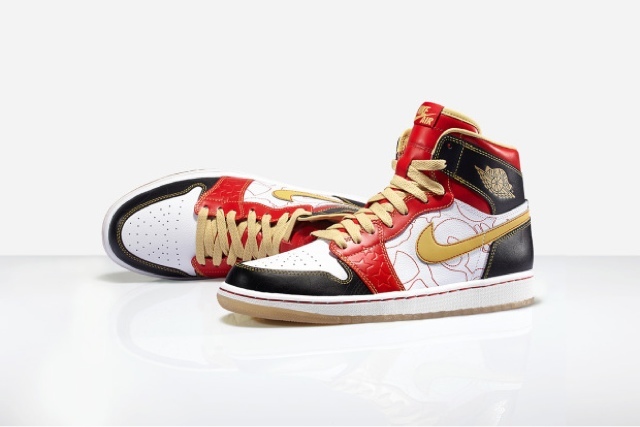 Gold stitching, laces, Swoosh, silk lining and Jordan logo, along with subtly debossed red stars on the forefoot and a translucent gold outsole complete the bold look. The XQ in the name is an abbreviation for “Xi Qing,” which translates to “happiness and celebration” and explains the auspicious color choices for the shoe. Look for the Air Jordan 1 Retro High OG XQ at nikestore.com.cn, the Nike Huaihai Brand Experience Store and select retail outlets.